Here you’ll find every kind of video concerning Thailand. From the beautiful islands to the Bangkok nightlife and everything in between. Discover the ancient temples, take a ride on a tuk tuk, take part in the beautiful festivals, explore the famous markets or just hang out in a beer bar with some beautiful Thai women. There is a lot to explore in the colorful tapestry that is Thailand. 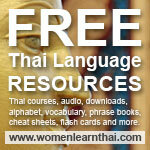 Holiday Thai Language Lesson 3: Thai Food! Walking Street Pattaya Thailand - Halloween Night 2010. Shum Kao Restaurant Thai Food at Pattaya!!!! Thailand Night Market - Unique Way to cook Ribs! Thailand market food - The good, The bad, And the ugly.